Acts as a "dongle". No "Software Activation" required! When used with this interface, VCDS is always fully-functional on any PC that meets our requirements. Fully automatic support of for dual-K lines found in "new" B6/8E chassis Audi A4 and 2002+ Audi A6 -- no VAS-6017required -- no manual switches! 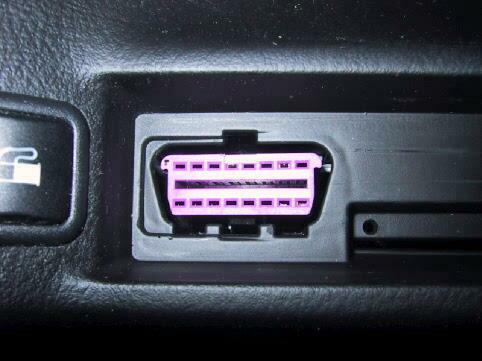 These interfaces come with an OBD-II type connector which plugs in to most 1994 and newer VW's and 1996 and newer Audis. 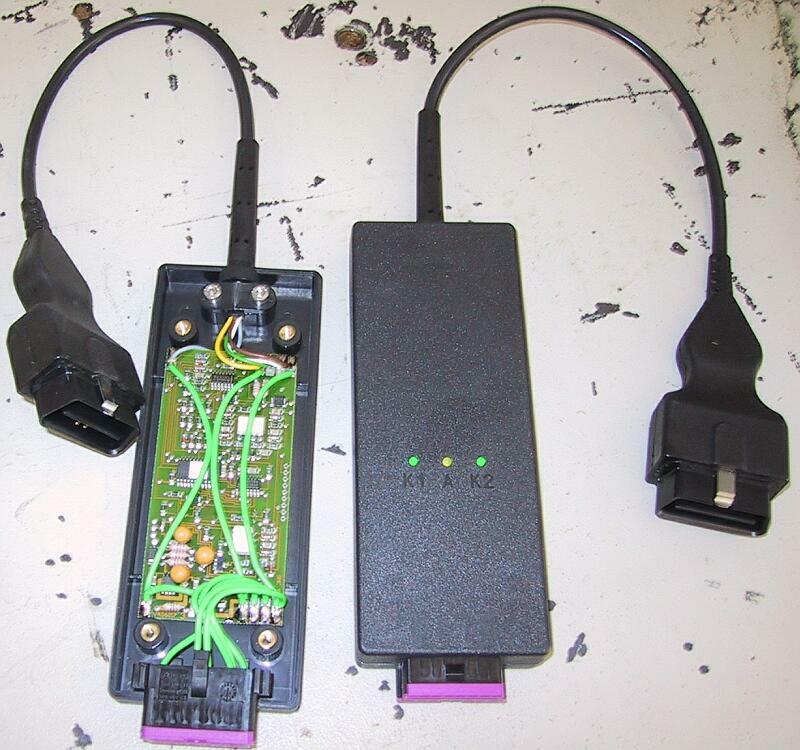 Many 1990-1995 Audis and 1990-1993 VW's have the "2x2" data link connector, click here for more info. These interfaces work with most diagnostic-capable VW, Audi, Seat, and Skoda models from 1990 through 2004 but does not work with any model requiring a direct CAN connection for diagnostics. If you have a 2003+, check to see if your car has a CAN connection. 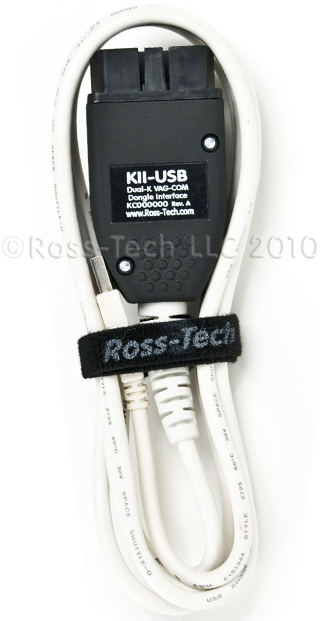 The KII-USB does not support Turbo Mode, the Clear All DTCs function or Activating/De-Activating Transport Mode. A HEX-USB+CAN (or other newer interface) is needed for those functions. We recommend at least a 1 GHz Pentium-3 (or AMD equivalent) with 128 MB of RAM and Windows XP or newer. Windows Vista , 7, 8, or 10 on a machine robust enough to support the respective operating system are also fine. As of version 10.6, we no longer support Windows 95, 98, ME or NT4. If you're using a PC that has a CPU speed less than 1 GHz and which has a Serial port, then you should consider the Serial HEX-COM+CAN instead. The cable on these interfaces are about 6 feet long -- just right for most laptops. The USB standards do not allow for passive extension cords! We have tested many Active USB extensions and have found one that works. You can order the 16-ft Active USB Extension from our Store. We do not sell or support any other brands or models of USB extensions, if you have problems when using one, the first thing we're going to tell you is to eliminate the extension. If you plan to use a desktop PC, we recommend you buy the Serial HEX-COM+CAN instead. The interfaces act as a "dongle" for VCDS (VAG-COM), so VCDS should be fully functional on any PC when used with this interface. However, product support is provided only to the original purchaser. If you buy a second-hand interface from someone and want support, you'll still need to pay $99 to register. Out of production. No longer available. These interfaces should be used with the latest version of VCDS software. This interface performs best with Windows XP, Vista or 7. It can be used with Windows 2000, but performance may be somewhat degraded if using Windows 2000 and compatibility with "difficult" control modules may be reduced. These interfaces require a special driver to be installed on your PC. It does not emulate a COM port.